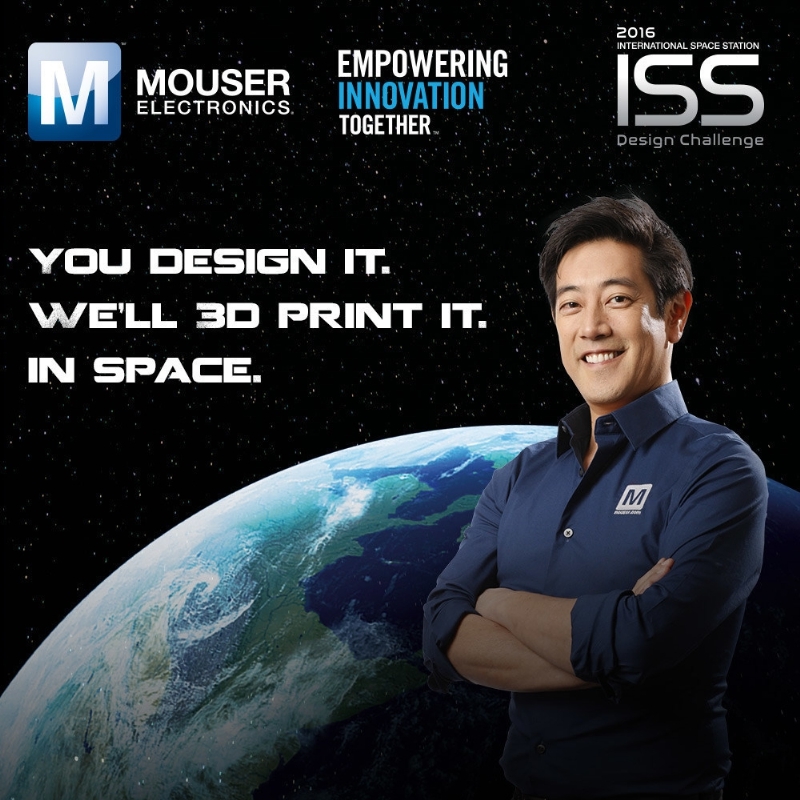 Mouser Electronics Inc. today announced that celebrity engineer Grant Imahara and former commander of the International Space Station (I.S.S.) Colonel Chris Hadfield are among the guest judges for the I.S.S. Design Challenge, the newest series in the exciting Empowering Innovation Together™ program. Mouser is accepting entries for this incredible competition now through Oct. 7, 2016. The I.S.S. Design Challenge, co-sponsored by Mouser's valued suppliers Amphenol and Intel®, is a call to college and university students, engineers, and makers, to create a 3D-printable project designed to help I.S.S. astronauts in space. Designs may include small electronics to be used with the object. All entries will be judged by Grant Imahara and Col. Chris Hadfield. "Imagine how exciting it would be to see your design made in space," said Glenn Smith, President and CEO of Mouser Electronics, a leading global distributor of the newest semiconductors and electronic components. "We are really excited to present this unique contest. We hope our wide range of electronic components will enable people to create whatever their imagination sparks." For the I.S.S. Design Challenge, Mouser has partnered with the Institute of Electrical and Electronics Engineers (IEEE) and Made In Space, along with Hackster and MacroFab. The winner of the I.S.S. Challenge will receive a 3D printer, a consultation with Made In Space — pioneers in additive manufacturing technology for use in the space environment — and the prestige of seeing their design 3D-printed aboard the I.S.S. "I'm honored to help judge the hard work of brilliant engineering minds," said Col. Chris Hadfield, an astronaut of 21 years, who has made three spaceflights and 2,650 orbits of Earth. To accompany the contest, Mouser Electronics, Chris Hadfield and Grant Imahara will release a series of videos on the Empowering Innovation Together site at www.mouser.com/empowering-innovation. "Good morning, Earth!" That is how Colonel Chris Hadfield—writing on Twitter—woke up the world every day while living for five months aboard the International Space Station. Since then, Colonel Hadfield—who served for 21 years as an astronaut, completing three spaceflights and 2,650 orbits of Earth—has become a worldwide sensation for infusing a sense of wonder into our collective consciousness. Over 32 million people have watched his famous cover of David Bowie's Space Oddity, the first music video made in space, and he is the author of two internationally bestselling books, An Astronaut's Guide to Life on Earth and You Are Here. With his feet now firmly planted on Earth, Col. Hadfield works tirelessly to inspire young people to do what they love (especially, if it's space-related) and to be fascinated by the world around them.